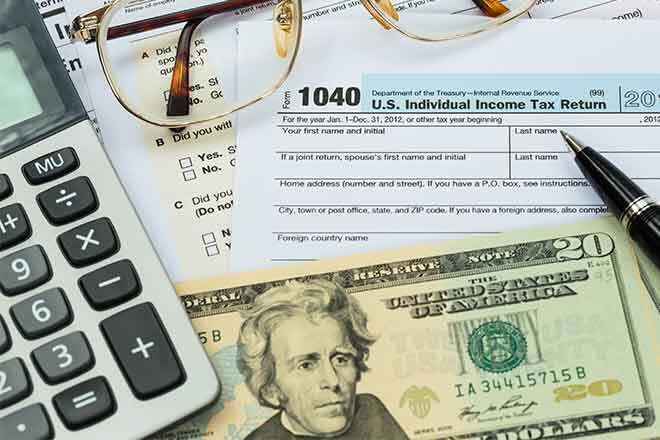 It's tax time in the U.S., which means Americans and residents are hurriedly poring over paperwork, filling in forms and hoping to file by the April 15 deadline. While for many it may be routine, for others it's a significant source of stress. A friend recently told me taxes were "driving her crazy" because she was worried about the ramifications of making a mistake. One way to reduce a stressful situation is to think about the worst case scenarios - and just how unlikely they are to transpire. So to calm her down, I pointed out a few facts about what could happen if you do something wrong on your taxes and then regaled her with the only story I could find of the tax man actually driving someone crazy. We may as well start with the absolute worst case scenario if there's a problem with your taxes: You could go to jail. The IRS also put another 1,200 people in jail for other severe crimes like identity theft, money laundering or not reporting money earned from drug trafficking. The IRS is very clear in its instructions: "Income from illegal activities, such as money from dealing illegal drugs, must be included in your income on Schedule 1." Lots of people make minor math errors when they file their taxes. But if you do, you shouldn't sweat it. The IRS reported that 2.5 million returns for 2017 had these kinds of errors. About half a million were so small, however, that the agency didn't even notify the filers about it. And the likelihood that you'll make a math mistake has declined in recent years at the same time that the IRS has promoted typically free web-based software that crunches the numbers for you. In 2002, for example, the IRS sent out 13.3 million math error letters. But like going to jail or getting audited, the fear of this is greatly overstated because the vast majority of people in the U.S. either get a refund or don't owe the federal government any money - more than 80 percent of filers in 2016. The average refund this year is around $3,000 - little changed from last year before the 2017 tax law took effect. Hopefully, if tax season is stressing you out, the above facts help you feel a bit better. If they don't, maybe it will help to know I could only find a single example of someone going crazy over taxes - and it happened long ago during a special period in American history. He was originally King George III's official legal representative in Boston before resigning and joining the revolution's leadership. Otis is the Patriot who coined the famous slogan "taxation without representation is tyranny." Fortunately, dealing with the tax authorities today is much safer - even in Florida, where collectors were recently discouraged by the state attorney general from carrying guns on the job. In other words, there's little reason to sweat tax time. There is little chance of going to jail, being audited or owing a huge amount of money. There is almost no chance you will be beaten up by the tax collector, as Otis was. The most likely result is you will receive a refund like most people. So if you're one of the millions of people who put off filing their taxes to the last minute, why delay?